Archives for December 2018 | Evelyn Mc Marketing! Evelyn Mc Marketing loves Christmas and even though I spend every day in the world of digital media and technology I believe in the legacy of making memories , of taking time to really communicate with others and share what makes us different from the robots of tomorrow. There is never a greater time than Christmas for storytelling and imagination and using creativity to bring your message into peoples lives. As the author of a number of books including Crafty Kids Guide To Donegal and Its Wild Atlantic Way Wild Atlantic Way Mindfulness Colouring Book Just For Fun Activity Book my Christmas book Freckles The Elf Christmas Magic In Ireland is one of of my favourites. The story is about a couple who leave Ireland for a better life during the recession and move to New York City. Times are now improving back home, and they decide to return to Ireland with their young children. 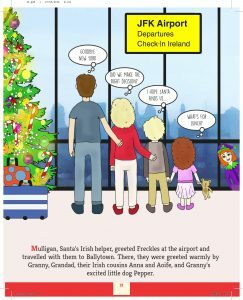 Their little boy Shaun is concerned that Santa will not find him at his grandmothers on Christmas Eve and so he writes a letter to Santa to make sure that he knows the family are back home in Ireland. Through the magic of storytelling, we discover the joy of Christmas how all the goodness, caring and sharing around the world will take everyone home to where they belong. I have received many e mails from families, the Irish Diaspora, all over the world who have returned just like Shaun and his family or those who plan to return in the future. I love to hear the stories of how their little ones believed that Santa’s #GPSChristmasheartbeat machine was tracking every good deed that they had done and that he knew where to find them on Christmas Eve. 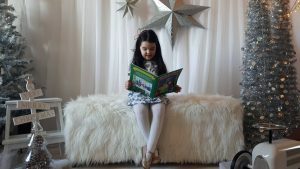 With my own family I have a tradition of reading a story on Christmas Eve and regardless of age we have been doing this for well over 20 years. The traditions and memories that we make are the foundation for the generations of the future. The digital world is all consuming, social media, technology , mobile devices all demanding constant attention. Leaving little or no time for us to really communicate while making life long memories. Santa has joined the digital age in this book too and can now use his #GPSChristmasheartbeat computer to track people all over the globe , knowing instantly all the kindness that they carry out every day and automatically updating them to his nice list. So this Christmas take time to read a book with your family, turn off the phone take time to build new memories and tell stories about old ones. Our mobile devices wont replace a laugh, a smile or a story. Making memories today is what will sustain us as human beings tomorrow. 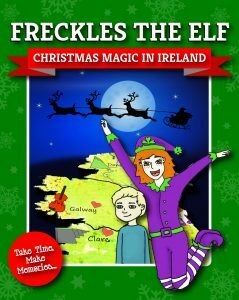 Freckles The Elf Christmas Magic In Ireland is a beautiful modern day read including topics such as emigration, refugees, united nations, Irish geography and culture all wrapped up in a magical Christmas story of loving and giving and celebrating Christmas wherever you are in the world. I know I am probably a bit bias but I promise that you and your family will love this beautiful book, written, illustrated and published here in Donegal. You can buy online here or call into Crafty Kids Toy Shop Letterkenny or McElhinneys Ballybofey. If you would like to write a book either as a personal project or as part of your business, get in touch . In 2019 we are launching writeabookworkshop.com with local and online workshops to help you through the journey of getting your book on the shelf or your e book online.